Cairn Toul, a beautifully wild and remote mountain in the Cairngorms massif of the eastern Scottish highlands, is notable not only for being the fourth highest mountain in the UK, but also for being the only mountain in the UK whose elevation in metres — 1291m above sea level — is also a 'mountain'. Großglockner, by way of a further example, the highest mountain in Austria, is a mountain whose elevation in feet — 12461ft above sea level — is also a 'mountain'. To elaborate: A number is a 'mountain' if its decimal digits start with 1, i.e. 'base camp', ascend continuously to a unique summit, i.e. to one largest digit, then descend continuously back to 1, i.e. back to base camp. Such mountain numbers are recorded as sequence A134941 (itself a mountain) in the On-line Encyclopedia of Integer Sequences (OEIS), from which you can also find this table of all possible 21,846 mountains (including 1 itself). Mountain primes, as the name suggests, are prime mountain numbers, prime numbers in other words whose decimal digits start with 1, ascend continuously to the summit of a single largest digit, then descend continuously back to 1. (The area chart image above shows a mountain range of the first 17 such numbers.) Mountain primes are recorded in the OEIS as sequence A134951 (yes, also a mountain prime), from which you can find this table of all 2620 such primes. When climbing a mountain, it is typical to descend back to base camp, i.e. back to where you started your ascent, but it is not always the case. Mountain numbers that ascend from one location (as an elevation) but descend to another — e.g. 3,598,432 — are considered to be generalised mountain numbers, recorded as sequence A134853 in the OEIS (there are 173,247 such mountains). Explain why there must be a finite number of mountain numbers. Construct a mountain range diagram for mountains of your choice. What is the Everest of mountain numbers? 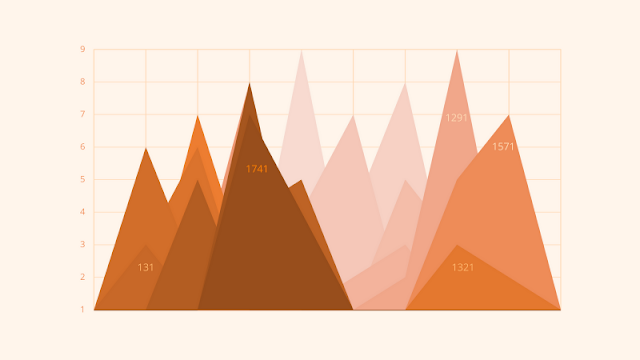 Explore the distribution of mountain number digits, i.e. how many mountains have 1 digit, 2 digits, 3 digits, etc. (OEIS sequence A135417). What mountain(s) has (have) the shallowest ascent? What mountain has the steepest ascent and descent? Many people find the most beautiful mountains to be those most pyramidal in shape, such as for example the Matterhorn in the Alps and Machapuchare in the Himalaya. Or palindromic mountain prime numbers (the largest is 123467898764321). Find all possible — i.e. 45 — Giza numbers. Giza numbers are so-called because they represent the pyramids of Giza in the sense that their first digits increase in consecutive order to a largest central digit, and their last digits decrease in the same consecutive order as they increased. The largest Giza number is 12,345,678,987,654,321 (OEIS sequence A134810). Of two mountain numbers chosen at random, what is the probability that their numerical heights — i.e. the magnitude of the number — will be in alignment with the elevation of actual mountains? For example, mountain number 1291 is 'higher' than mountain number 1571, but as actual elevations, 1291m < 1591m, so these two mountains are not in 'alignment'. Find as many actual mountains whose heights are mountain numbers, or mountain primes. What is the highest mountain in the world whose height is also a mountain (use metres and/or feet for the height)? You may find PeakBagger.com and PeakList.org useful starting points to collect your data. WolframAlpha may also help.